Happy September, everyone! Am I the only person who feels like the summer just flew by? Wasn’t it just May?? I can’t believe we’ve wrapped up our summer 2018 wedding season! This summer we were so blessed to work with a a beautiful, fun, warmhearted group of brides and grooms and their families! I am only just now beginning catch up on my blogging, and I’ve decided to try something new with my post-wedding workflow. I’ve set a goal to blog sneak peeks of my sweet weddings within a week of the happy day! I didn’t quite make the mark with Mallory and Dale - they’ve been Mr. and Mrs. Milican for a week and a half! But their wedding on September 8th at the Hewlett Barn and Stables was so fun, sweet, and pretty, I’m excited to share a little sneak peek of their happy day today! Blue is one of my favorite colors, and when Mallory told me that her color scheme would include the soft tones of slate blue, I couldn’t wait to play with this cool, calm color against the warm wood of the Hewlett Barn. 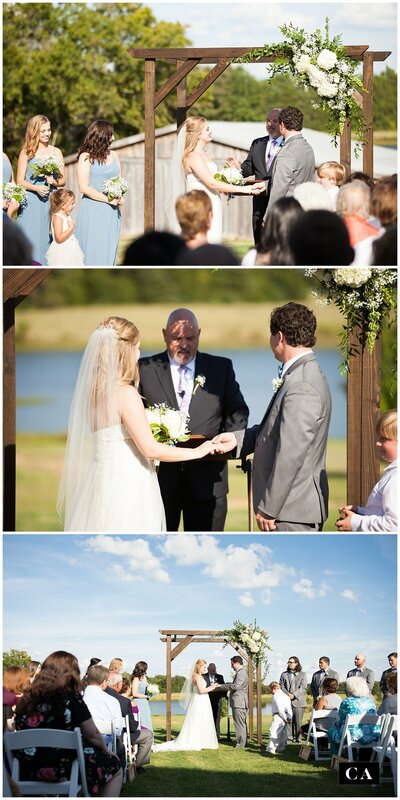 Plus, Mallory and Dale were blessed with bright blue September skies on their wedding day! It was as if the whole day was making the most of the color blue! Every single one of Mallory and Dale’s wedding details had a personal touch. 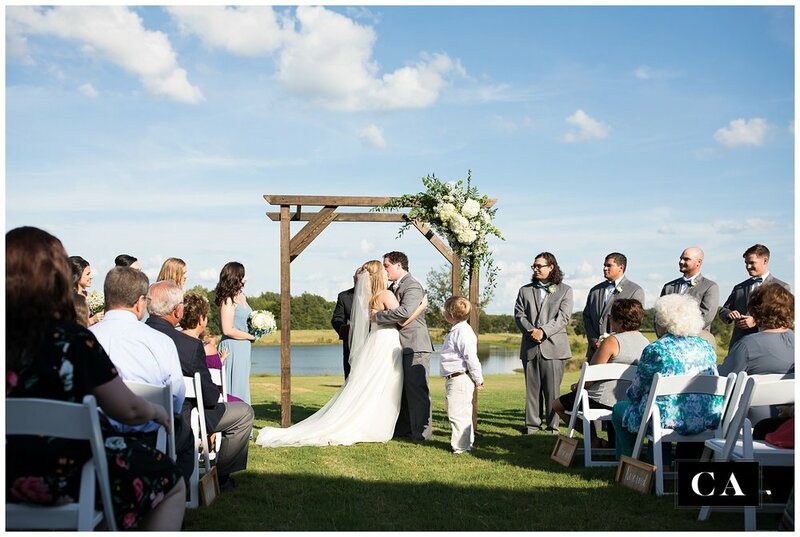 I was so impressed when Mallory told me that she designed her wedding arbor, and her father built it! And not only that, all their sweet wedding signs were created by Mallory’s mom! So many brides now are choosing to create DIY wedding details, and to me, that adds an extra layer of meaning to the wedding day! 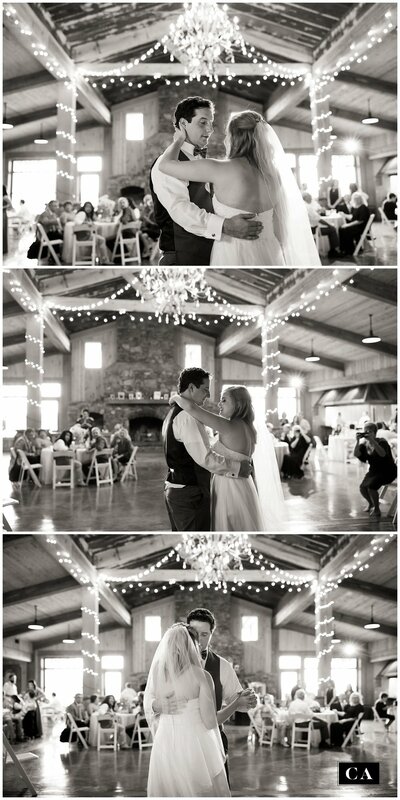 And can we stop for a moment and talk about how sweet Mallory just glowed on her wedding day? Mallory and Dale are such a fun couple to hang out with, y’all. When we photographed their engagement session earlier in the spring, I think we talked and joked almost as much as we photographed. We immediately bonded when they picked up on all my Jim and Pam references! Plus we have a similar relationship dynamic - just like me, Mallory fell in love with a natural risk taker, and she’s not one at all! For example, Dale is a skater, wakeboarder, skier, AND snowboarder, but Mallory hates skiing! I hate skiing too, so we got a kick out of that! We also discovered a cool connection: Mallory’s uncle was Jonathan’s first flight instructor! These two went to high school together, but their love story began during their college years. (I believe I heard a story on their wedding day about how, before they began dating, Mallory drove hours and hours to attend a New Year’s Eve party, just because Dale would be there!) Dale proposed to Mallory last October at Disney’s Magic Kingdom, in front of Cinderella’s Castle, in the middle of Main Street U.S.A., surrounded by crowds! (I told you he was a brave guy!) But on their wedding day before their First Look, it was Dale, the risk taker, who was the nervous one. And then he saw Mallory, and he couldn’t stop looking at her… and I don’t think he wanted to ever let her out of his arms. Mallory and Dale’s wedding party was a fun, relaxed group! They were so excited to share the day with Mallory and Dale and celebrate with them! I remember telling Mallory that she and her maids had the most gorgeous eyes - “How on earth did you manage to find friends with such pretty eyes??”…. and then she reminded me that two of them were her sisters! (This is one of the reason why Jonathan shakes his head at me throughout every wedding…. The things that I end up saying, y’all!) The groomsmen kept everybody laughing, and were up for anything Dale thought up! 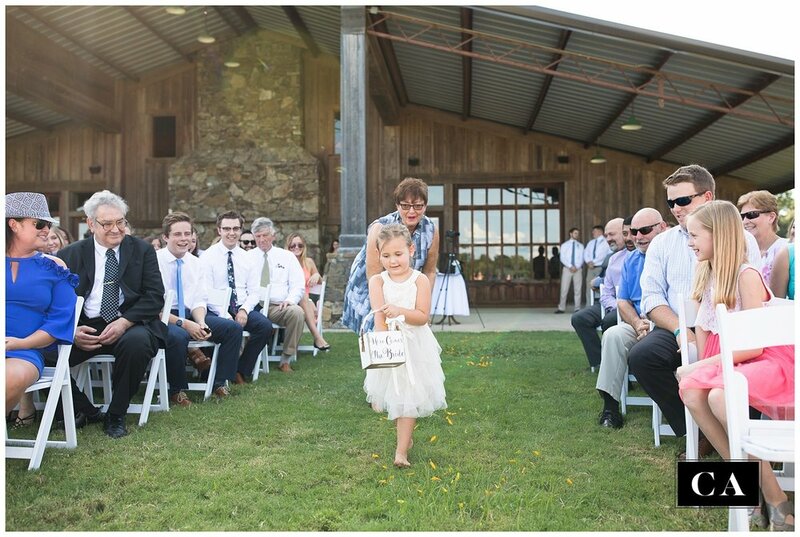 And don’t miss their SWEETEST little flower girl and ring bearer, either! These two cuties were so happy to be in the wedding - they took their jobs VERY seriously, and loved having their pictures taken! Have I told you the story of the blue bow yet? This is truly one of my favorite wedding details to date, because it tells so much about their love story! The sweet bow on Mallory’s bouquet was the bow from the VERY FIRST bouquet that Dale ever gave her. Y’ALL!! How romantic is that? I love that blue bow. 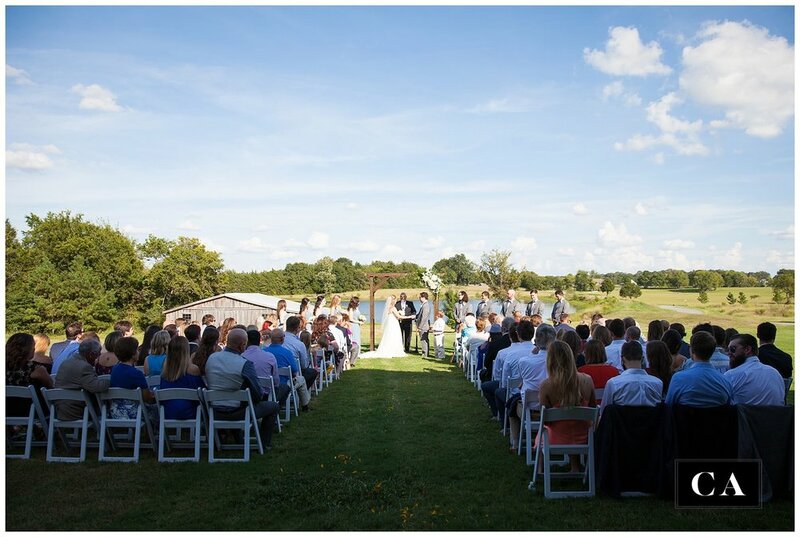 Mallory and Dale said “I do” under the endless blue sky of a beautiful September day. I’ll always remember Mallory’s joyful smiles, and how their officiant, Mr. Rusty Sullivan (who is Mallory’s stepdad) told their love story from the point of view of the family! Mallory and Dale, you are much loved! Since Mallory and Dale’s ceremony was at 4:30 in the afternoon, they still had plenty of daylight to play with for portraits later, during golden hour. So after a few family group portraits, we all headed inside to celebrate under the beautiful lights of the Hewlett Barn. One of the highlights of the Reception was Dale’s groom’s cake - it was a surprise for him! Y’all, earlier this year we photographed a wedding where the groom’s cake was a Baby Groot. I didn’t think anything could equal that cake, but then I saw Dale’s - and it was a Dragon Ball Z cake! Cake artists these days can make ANYTHING into a cake! I was so delighted and impressed, and so was everyone at the wedding! And I also want to say that the wedding cake was lovely and unique too - I loved the delicate fondant petals. It reminded me of a ballerina’s dress! Their two cakes were a wonderful snapshot of Mallory and Dale’s personalities! Finally, I loved how everyone started dancing immediately, and I don’t think the dance floor was empty for the rest of the night. Just as the sun was beginning to near the horizon, Mallory and Dale stepped away from the dancing for a few minutes for some beautiful golden hour portraits. I’m so glad we did! Not only did we have that gorgeous creamy late summer evening light, we were able to take portraits with their very, very cool getaway car. Just a lovely vintage Mercedes convertible, y’all…. such a PERFECT car for these two to drive away in! And of course, I had to have a portrait with these two in front of my favorite tree, and with Mallory’s sweet altar. The rest of the evening was filled with dancing, laughter, shenanigans, more dancing, and even an amazing crowd sing-along! I love crowd sing-alongs. Can we make them a new reception tradition? Pretty please? Mallory and Dale departed into the night under the joyful neon light of a hundred glow sticks! And it was the PERFECT way to finish celebrating with these two newlyweds! Mr. and Mrs. Milican, you wedding day was truly #oneinamilican. We loved spending the day with you and your family and friends! Your wedding day was everything we expected it to be, and so much more! I can’t wait to spend the next few weeks putting the finishing touches on their full wedding gallery! But for now, I hope you’ve enjoyed this sneak peek of their sweet wedding day!